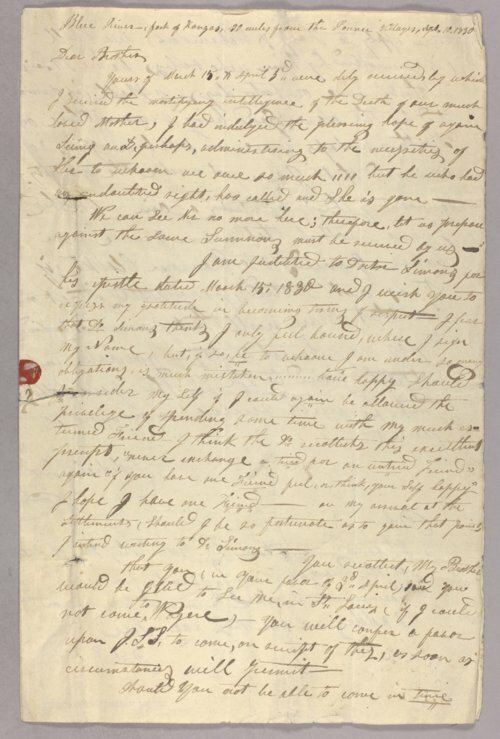 Writing this letter thirty miles from camp Leavenworth, Jedediah Strong Smith appeals to his brother Ralph Smith of Ohio to meet him in St. Louis. Jedediah discusses the death of his mother, a correspondence with a Doctor Simons, the nature of freindship and a debt owed to Ransom Clarke. Born in New York but raised in Ohio, Smith was ambitious for adventure and made numerous journies through the western territoires, gaining considerable fame as an explorer. In May 1831, at a water hole near Cimarron, Kansas, Smith was surrounded and killed by Comanches.